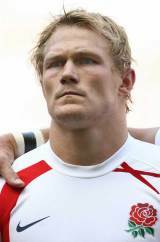 Josh Lewsey was a versatile, intelligent and fiercely competitive player, at home on the wing, at centre or fullback. During an illustrious career his stern determination and defensive ability were bolstered by attacking guile and line-breaking ability. Lewsey joined Wasps as a schoolboy in 1995 after playing junior rugby for Amersham and Chiltern Rugby Football Club and played for Bristol while studying at Bristol University. He rejoined Wasps at the end of his studies. He was one of the few survivors of England's 1998 "Tour of Hell" in Australia and New Zealand, winning his first cap at inside centre against the All Blacks. After featuring for England on their 2001 North American tour, Lewsey graduated from Sandhurst and served for two years as an officer with the Royal Artillery of the British Army. He decided to pursue a professional rugby career after graduation, continuing with Wasps and England. Lewsey's home debut for England came in the 2003 Six Nations win over Italy, and he celebrated the occasion by bagging a brace of tries. England proceeded to complete a Grand Slam, marking a hugely successful introduction to the tournament for Lewsey. Lewsey played an integral role in England's successful 2003 tour of Australia and New Zealand, and claimed the fullback jersey as his own as Jason Robinson switched to the wing. His career-high came in the 2003 World Cup, as he helped England to the title of World Champions. Lewsey's best performance of the tournament came against Uruguay, when he crossed for five scores in a 111-13 rout. Lewsey was later selected by Clive Woodward for the 2005 Lions tour to New Zealand, and played in all three Tests for the doomed tourists. Lewsey was given the summer off in 2006, climbing to the base camp of K2 in the Himalayas without the permission of Wasps, who surely would have objected. He was also an integral part of England's run to the 2007 World Cup final, scoring the winning try against France in the semi-final before a hamstring injury ruled him out of the final loss to South Africa. Lewsey did not feature for England in the 2008 Six Nations, and despite being selected for England's Elite Player Squad under Martin Johnson he was also overlooked for England's autumn internationals against the Pacific Islands, Australia, South Africa and New Zealand. In December 2008, Lewsey announced his retirement from international rugby to concentrate on his hugely successful club career with Wasps, with whom he has won the Heineken Cup and Premiership. In April 2009 Lewsey announced that he would be retiring from all rugby at the end of the 2008-09 season, with his reason being a desire to climb Mount Everest. His attempt on the mountain, in 2010, was thwarted 500ft from the peak when his breathing apparatus failed. He later worked as a management consultant before being persuaded by Wasps to return on a short-term deal until the end of the 2010-11 season. Lewsey was appointed as the acting chief executive of the Cornish Pirates early in 2013 but left the Championship club after being appointed as the Welsh Rugby Union's head of rugby later the same year. In his current role he is responsible for the operational and strategic management of the whole of the game in Wales from community to elite level outside the senior international squad.